After a break of several years, I’ve recently taken up knitting and crochet again (I never officially stopped but I didn’t get around to making anything – apart from a case for my mobile phone – in the last 3 or 4 years). Having refreshed my memory on the basic skills, I’ve plunged straight into trying a few new things in crochet. 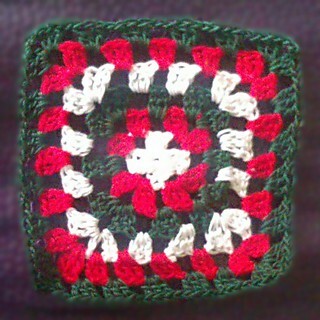 In particular, I’ve finally got round to entering the worlds of granny squares and thread crochet. 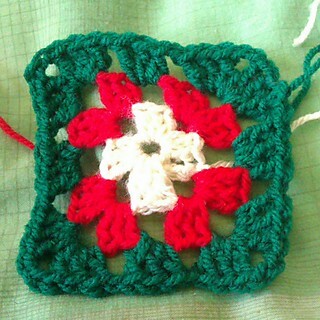 Granny squares are probably the stereotypical crochet motif, as well as a staple of 1970s fashion. They are relatively quick and simple to make and can be very colourful and versatile, offering plenty of scope for the imagination as well as a good opportunity to use up scraps of yarn without having to worry too much about carefully following patterns. Just the kind of thing I like, so it’s perhaps fairly surprising that I never got round to making one in my earlier crochet career. This, like all the crochet I’d previously done, was using yarn. However, there’s also a strong tradition of using thread (and much smaller hooks) for crochet. The basic techniques are the same, but the scale is somewhat smaller. I decided last week that the time had come to try out crochet using thread, since I’d acquired a set of hooks that included several thread hooks as well as yarn ones and I wanted to put these to use. I ordered 3 balls of #10 crochet thread (pretty much the standard size, I gather; it’s made of mercerised cotton and is quite a bit thicker than standard sewing thread but much finer than yarn), which again happened to be in the Welsh flag colours. My very first attempt with thread, on Saturday morning (once the threads I’d ordered had turned up), was a quick Möbius band. After this, I decided to try another granny square using thread. My thought was that this might make quite a useful coaster. If you look carefully at the lower left corner of this photo, you may spot what I noticed shortly after I’d finished tidying up the thread ends (i.e. the point at which it became too late to do anything about it) – a slight mistake whereby I accidentally worked an extra group of 3 stitches (in the red thread) into the middle of one of the groups in the previous round. The result is effectively that there’s an extra stitch group along one side of the square in the last couple of rounds and a bit of a hold in one of the stitch groups in the white round. Fortunately it doesn’t seem to have distorted the square shape too badly and it’s not too noticeable unless you look carefully but it does break up the symmetry a bit. I could rip half the work out and redo it (this would probably require the removal of the entire last two rounds), or just put up with the mistake. However, I remembered something I was once told about Navajo rugs, namely that they are always made with one deliberate and obvious imperfection woven into the fabric. Apparently this is supposed to let the spirit in and out of the blanket. Using Google, I managed to track down a reference to this on Brian McLaren’s blog and I’m fairly sure that when I first heard about the idea it was Richard Rohr who was being quoted (as McLaren does on his blog). I don’t believe that the rugs (or my coaster) need a hole for spirits to get in or out, and I can’t claim that I incorporated the imperfection on purpose, but I like the idea that perfection “is not the elimination of imperfection… [but] the ability to recognize, forgive, and include imperfection!” (to quote Rohr directly) and therefore I can view this as a reminder rather than a mistake.